Sunday: I returned to New York City in the wee hours, somehow both tired and energized, equipped with new knowledge and information, from the most transformative, radical, and love-filled educational conference I have ever attended. I was the recipient of a Montessorians of the Global Majority scholarship, which made the conference more financially accessible for many folks of color. The icing on the cake? St. Catherine’s University offered affordable housing to attendees for the duration of the conference. I managed to spend less than $200 for my entire 4-night stay. That’s about the cost of one night at a St. Paul hotel. Whew! The conference began with a retreat for Montessorians of the Global Majority to be honored and affirmed. A group on De-Centering Whiteness was happening simultaneously. There were outstanding keynote speakers both Friday and Saturday. 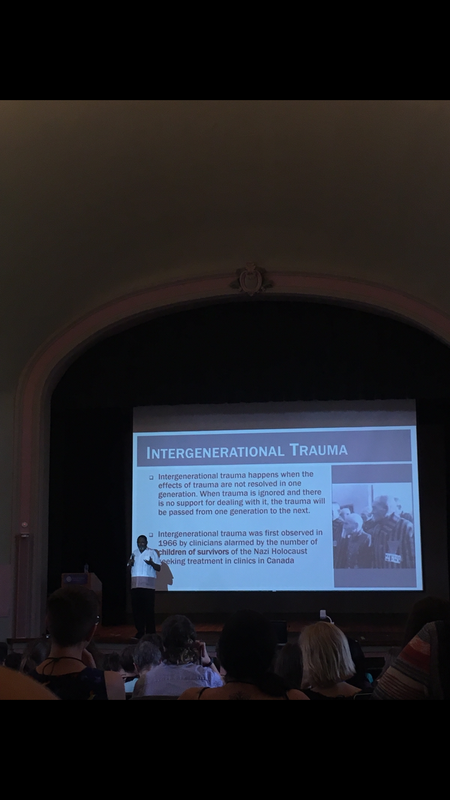 On Friday, we had an opportunity to learn about Historical Trauma from the deeply engaging expert on holistic, culturally sensitive trauma informed approaches, Mr. Sam Simmons. The following day, we heard the poetry and stories of Lorena Germán and Roberto Germán of The Multicultural Classroom, as they emphasized the importance of implementing culturally sustaining pedagogies and centering joy (especially the joy of people from oppressed groups) in our classrooms. We were reminded throughout the entire event that wherever we are in America, we are on the stolen land of Indigenous people. We should honor that and bring that into our conscious awareness as much as possible. A photograph of the Montessorians of the Global Majority Retreat taken by McKenna Patterson Photography. Furthermore, the conference could not have been more accessible and welcoming to mommas, caregivers, babies, and young children. There were many children under the age of one there. Nursing. Cooing. Laughing. Crying. Ever-present, ever-human, completely welcome and beloved (many folks at the conference emphasized that this work is all for them, after all). For families with older children, Sunny Hollow Montessori offered childcare. This is what inter-generational organizing looks like, y’all! There is so much more I have to share about this life-changing conference. Over time, as I process everything I learned at the wonderful breakout sessions, I will share more and more. To the organizers and sponsors of this conference, thank you, thank you, thank you! It was extraordinary. “The mission of the Montessori for Social Justice organization is to support the creation of sustainable learning environments that dismantle systems of oppression, amplify voices of the Global Majority, and cultivate partnerships to liberate the human potential. The overarching theme for the conference was “Reclaiming Montessori for Universal Liberation”. The many presentations focused on three primary areas of interest: Social Justice, Classroom Lesson Development, and Liberatory Educational Practices. All workshops encouraged and challenged Montessorians to engage in rigorous self-reflections as we work to “unlearn” biases and race-based practices that repress the liberation of humanity and to dismantle systems of oppression in America, our wider communities, our schools, and particularly, our Montessori classrooms. Find out more about Montessori for Social Justice and the incredible work they're doing here.